Go, go, go, go for G! I will save you all the gory details – but today is the first day we’ve had in well over a week to actually get to getting on with our letter of the (2) week(s) – G!!! Once there was a giant giraffe named George. He was green, giant, and gray. He loved to eat grapes and grass (and also green leaves!). 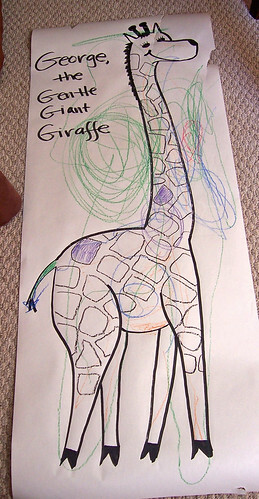 One day, George’s mommy and daddy came home with a new baby brother giraffe for George. The baby giraffe’s name was Gerald. Gerald was great (and he was not a giant giraffe like George, yet, because he was still a baby). Gerald liked to run around and jump, and play football, and go, but it bothered him when baby Gerald got in the way. George was always telling the baby to “Go away!” But George’s mommy and daddy reminded him that he needed to be gentle with Gerald. 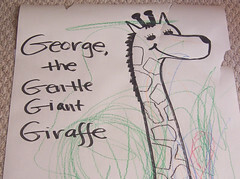 George remembered that God wanted him to be gentle, too, and from that day on, George became the gentle, giant giraffe. He and Gerald now like to eat gooey things, and play guitars, and go on walks. They watch gorillas jumping, and they love Gam and Great-Gam, and they go for walks. OK, so I also had an ulterior motive to doing a story about a gentle giraffe… EJ’s not so gentle with Dieter right now, and I hoped that this might be a good moral tale for him. I’m not sure how much he got it, but he got really into giving me details about what they like to do. He only needed little reminders to try to stick with “G” words. It didn’t always work, but I think the story turned out well. 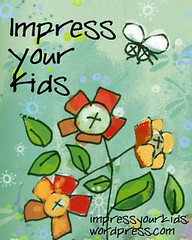 Click the link above to subscribe in your feedreader OR click here to get Impress Your Kid updates right in your inbox!